KRAKOW, POLAND. 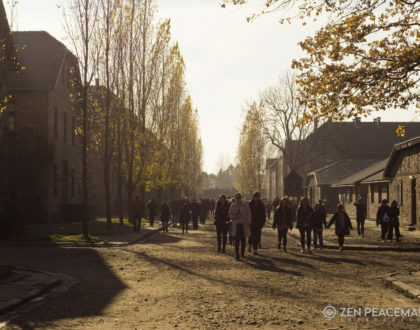 On November 5th 2017, prior to plunging into 2017 Zen Peacemakers Auschwitz Birkenau Bearing Witness Retreat, Bernie Glassman conducted a short and intimate ceremony recognizing Roland Wegmüller, Francisco Lugovina and Fleet Maull as Zen Masters in his lineage. L to R, front row: Paco Lugoviña, Roland Wegmüller, Bernie Glassman, Fleet Maull. Back row: Cornelius Collande and Genro Gauntt (hidden). Our most loving thoughts and intentions for deep peace radiate to you all as we enter the ever present bardos of being. Fare thee well Bernie! You indeed transformed the world with your labors,love and compassion!